Outlook includes a Junk Email filter. This filter cannot be updated by the end user and Microsoft stopped releasing updates for it in November 2016. For most users, setting the Junk email filter set to high is good enough, especially if their mail is also scanned by a server side anti-spam filter. If it does not meet your needs, check out the Anti-spam Tools below. As time goes on, Outlook's junk email filter will become less and less effective. Note: The Junk Email filter runs before Rules Wizard. Adding Senders addresses or domains to the blocked lists is an ineffective way of dealing with spam. Because few spammers reuse addresses and the lists hold a limited number of addresses, it fills the lists with addresses that will never be used. For this reason, only use this method to add addresses which send you mail often when you are unable to unsubscribe from the mailing list. The following article explains how the Safe and Blocked senders lists work. I think Sue's low-maintenance method here may work better for many people, requiring a rules update only when you join a new mailing list. The last four rules in my Rules Wizard list work together to make sure that undesired messages not sent directly to me are diverted to a Junkmail folder. These rules are mostly designed to handle mailing lists that I've subscribed to. Some lists work better with a "from people or distribution list" rule, while others are best handled with a "sent to people or distribution list" rule. When I receive the first message from any new mailing list that I've subscribed to, I examine the header to figure out whether the From or To address is the one that distinguishes the distribution list; it's usually easy to tell. Then, I right-click and choose Add to Contacts to add the address to my Contacts folder. (You could also add to the Personal Address Book if you have it in your profile.) This step is crucial to gathering all the addresses for distribution lists into my first two anti-junkmail rules. Rule#1 - Pre-Junk FROM. Can use people or distribution list condition or use the in address book condition to apply to all addresses in a contacts folder. When you use the "sender is in address book" condition, Outlook will look up the address in the address book you specify. Depending on the number of entries in that address book, this condition might skip some messages if you receive a lot of mail. You really only need the "stop processing" action; using the "move" action is optional in modern versions of Outlook. Rule #2 - Pre-Junk TO: Use people or distribution list condition or the in address book condition. Whenever you join a new list, add its To or From address, as appropriate, to one of the above two rules. The next rule handles mail sent to any of my own personal e-mail addresses (e.g. sue@slipstick.com). I have also put these addresses in Contacts. I find that this rule works more reliably than rules created with the sent directly to me or where my name is in conditions. You may actually need quite a few names in Rule #3. Outlook is be sensitive to the display name. It is an easy-to-use Microsoft Outlook add-on designed to provide an advanced intelligent protection against junk-mails, viruses, unsolicited emails. The program uses Bayesian filtering technology that identifies about 99% of incoming junk messages. QMailFilter seamlessly integrates into the MS Outlook, scanning all incoming emails. Emails identified as junk are moved to the Junk Email folder. Multi-modal anti-spam tool for Outlook 2000. Uses word and regular expression filters, blacklists, whitelists, real-time blackhole lists, Bayesian filters, character set filtering. Works with all kinds of Outlook accounts. Can convert RTF and HTML messages to plain text, remove external image links, and provide access to files that Outlook security blocks. The Junk E-mail Reporting Tool allows you to submit junk e-mail to Microsoft for analysis. When you choose to submit junk e-mail, it will be deleted from your Inbox and sent to FrontBridge, a Microsoft company, for analysis to help improve the effectiveness of FrontBridge's junk e-mail filtering technologies. For Outlook 2003 and Outlook 2007. Version 1. Anti-spam tool using Bayesian filters, whitelist, blacklist, and challenge queries. Automatically bounces known spam messages back to the sender as if your address didn't exist. Also blocks potentially dangerous attachments. SpamBayes attempts to classify incoming email messages as 'spam', 'ham' (good, non-spam email) or 'unsure'. First SpamBayes must be trained by each user to identify spam and ham. Essentially, you show SpamBayes a pile of email that you like (ham) and a pile you don't like (spam). SpamBayes will then analyze the piles for clues as to what makes the spam and ham different. For example; different words, differences in the mailer headers and content style. The system then uses these clues to examine new messages. Open source anti-spam add-in. If you are bothered mainly by messages sent to you in foreign languages, see Foreign spam removal -for suggested characters to use in a Rules Wizard rule. I have a slightly different problem - legitimate but unwanted emaiI. I suspect it is because I have a presence on some professional websites and while my email is not listed, sellers can figure out my corporate email address easily. We use a firstname.lastname format - easy to guess. I'll get an email from marketing@suppersoftware.com and block that, then I receive an email from Nat@suppersoftware.com, then sales@suppersoftware.com, then Sue@suppersoftware.com and on and on. I add their domain to the blocked senders list but this is a manual process. Is there a tool that lets me select and click a macro that will add their domain to the blocked senders list? In practice the trusted list of contacts can't be used as new email domains come to my inbox and I genuinely need to respond. I am on High now - the Safe filter will still require me to inspect the junk emails which is what I want to avoid. I just want to have the option to filter the well meaning but unwanted emails. 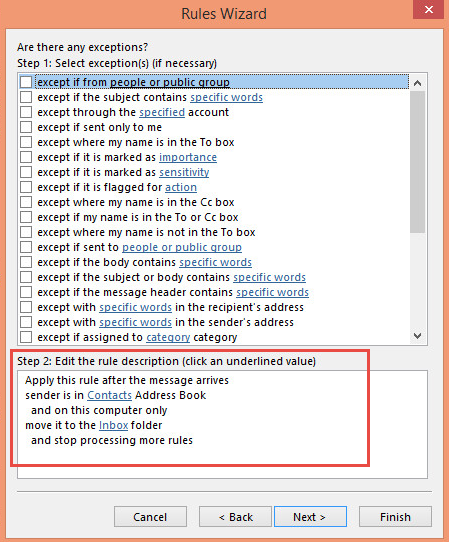 There are various instructions in Outlook 2007 and on the web about how to access the Junk mail filter options, either through Tools>options>preferences, or through Action. Neither of these routes in my Outlook lead to anything mentioning junk mail. Where might it have been hidden? I have downloaded the recent (February 2016) update but cannot find any instructions on how to use it. Updates install automatically if you have windows update set to install them - otherwise you need to run the msi or exe file. you don't have this button in 2007's Tools, options? What type of email account do you use? What is Outlook's junk mail option level set to? Try High (default is low). Good day. whenever I send an email, it reflects in the junkmail folder. How can I overcome this? I use Outlook 2010. The sent message ends up in Junk instead of the Sent items folder? What type of email account do you use? If IMAP, check the Sent mail settings in File, Account Settings, double click on the account, then more settings, sent items tab. Is the sent folder selected? how do I move items in my blocked senders list to junk without it arriving in my inbox. What type of email account? Are you downloading full items? Items on the blocked list should be moved to the Junk folder as they arrive but when you download only headers (most common with IMAP accounts), the junk filter doesn't run until the full message is downloaded. See How to disable the junk mail filter to disable it completely. I am particularly frustrated with the rule that says "move... then stop processing further rules. That means it only processes ONE rule. I have set up and reset up rules 3-6 times, and I continue to get rules failing, and that is all that I find. I do ger an error message, but it makes no sense either. What is the falue of "stop processing rules"? Stop processing should only stop the rest of the rules from acting *on the current message*. Something else is causing the rules to fail. What is the error message? For example, if you have a rule to move a message from Bob and a second rule to move message with "Hi there" in the subject and Bob sent you a message with Hi there in the subject, both rules would apply to the message. Stop processing tells outlook to move on to the next message once a message is affected by a rule - so if the first rule has stop processing, it moves the message from bob and stops checking for more rules that match.